It was a gorgeous sunny, but cold day, in February, and my 2 boys aged 4 and 2 were bounding with energy, and desperate to let off some steam. We headed to Conkers in the National Forest, which is one of the attractions included in the fantastic Stay, Play and Explore package run by Go Leicestershire which allows you to visit 3 attractions and have a night in a 4* hotel for just £129. 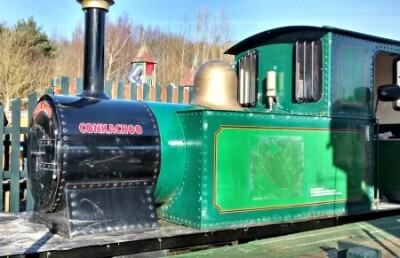 Conkers is located in the National Forest, and has over 120 acres to explore including playgrounds, the Conkerchoo train, and an indoor Discovery area which is full of interactive exhibits. It is a great day out whatever the weather. 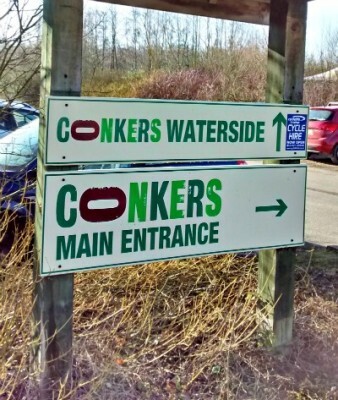 There are 2 sites (the Discovery Centre and the Waterside Centre), which are linked together by the Conkerchoo Train. We started off in the Discovery Centre which is a large indoor area full of interactive exhibits about woodland and the seasons. 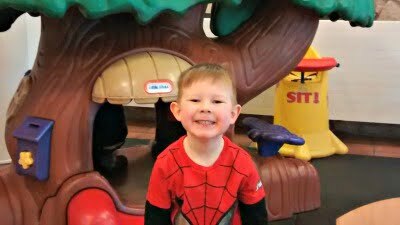 There are loads of buttons to press, and flashing lights, which sent my boys running off in different directions ready to explore. Their favourite part of the Discovery Centre was the interactive forest floor, which was a floor simulated with butterflies and leaves falling on it which was perfect for jumping on. Inside the Discovery Centre there is also an Enchanted Forest play zone where children can explore the forest in more detail and climb through the trees and across rope walkways – perfect for rainy days. It was a crisp winters day when we visited, so we headed outside more or less straight away. It is here that you really get an appreciation of the beauty of the surroundings at Conkers. 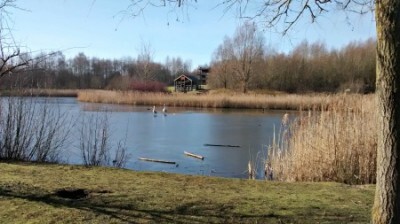 The centrepiece is a large lake with ducks and geese and leading off that are lots of trails, grassland, playgrounds and the Conkerchoo train station. There is loads of space to explore and run around. Our highlights included the Wildlife Pond and the Wetland Walkway and the Fairy Labyrinth which the boys found really exciting. The boys headed straight for the little playground and then we headed off for a little walk around the lake. There were lots of muddy puddles for them to jump in so I was pleased we had brought our wellies. We spotted a Viewing Tower, and it was at the top of this that the spied the Conkerchoo Train Station. 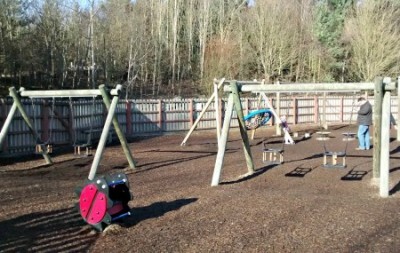 Off we headed to the train which took us to the fantastic Playdale adventure playground near the Waterside Centre. This was perfect for both boys. 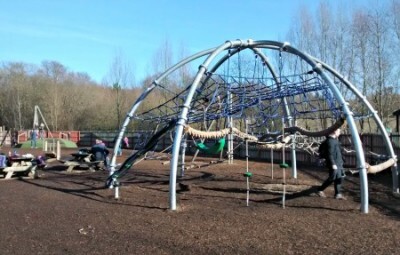 There was a smaller adventure playground for the 2 year old toddler and then more advanced things such as balancing beams, tyres and higher things to climb on the 4 year old. The boys spent ages here. By this time the boys were feeling peckish so we headed back to the Discovery Centre to go to the Café for a bite to eat. The boy both chose the Lunchbox option which was a drink, sandwich, crisps and a chocolate bar for aprox £4. The adults menu mainly comprised of burgers which was fine for my husband, but I would have preferred something a little lighter and dare I say it heathier? Anyway, the food came quickly and did the job so all was good. All in all, we thoroughly enjoyed our day out at Conkers. Although it was sunny when we went, I could see that there would still be plenty to do if it was raining. It was a perfect day out for 2 year olds and 4 year olds who want to run around, explore, play in great playgrounds, feed ducks, go mini beast hunting and climb viewing towers. If we lived closer, I would definitely get an annual pass for Conkers and visit often. There will always be something to see there whatever the time of the year, and children will never grow tired of exploring the lakes, forest and woodlands. There is a Children’s hot and cold lunch option in the Café (aprox £4 / £5) and a Carvery in the Waterside Centre on a Sunday which costs £4.95 for children and £9.99 for 2 course for adults. Prices – Adults cost £8.95 each and children aged 3+ are £7.25 inc gift aid. Book online and get a 10% discount. Alternatively visit as part of the Stay, Play and Explore package where you can stay 1 night in a hotel and visit 3 out of 5 family friendly attractions in Leicestershire.